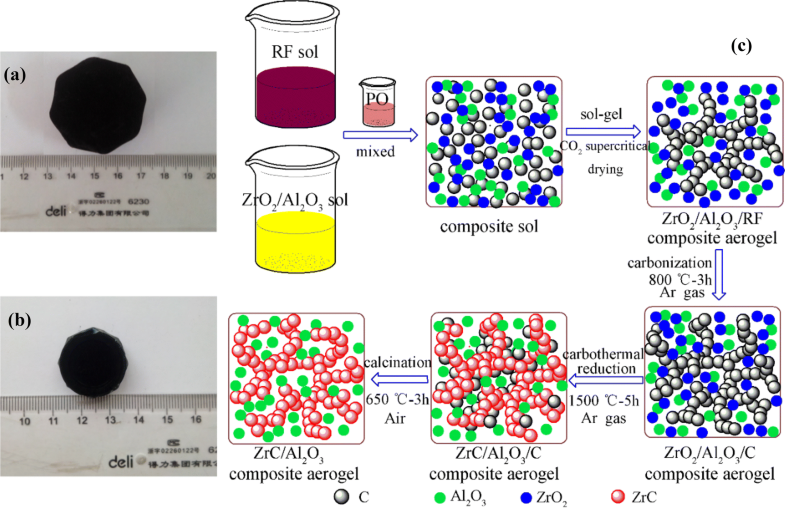 The ZrC@Al2O3@carbon composite aerogels are obtained from low-cost inorganic salt of zirconium and aluminum as raw materials through sol–gel route and carbothermal reduction process. The effects of reactant molar ratios and heat-treatment time on physicochemical properties of ZrC@Al2O3@carbon composite aerogels are investigated. 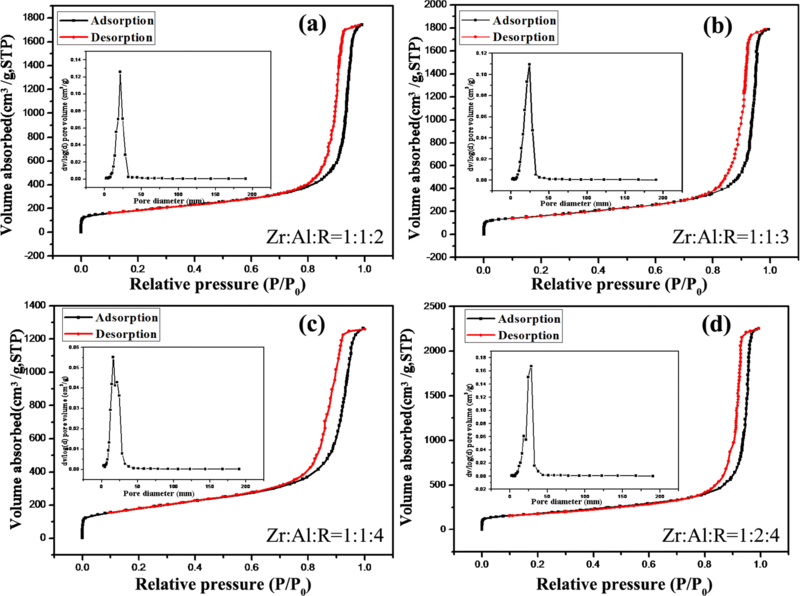 The results show that the compressive strength of ZrC@Al2O3@carbon composite aerogel is as high as 1.31 MPa. The specific surface area of sample is as high as 650.4 m2 g−1, which is beneficial for its application of thermal insulation and catalyst supporting at elevated temperatures. After heat-treated at 1500 °C for 5 h, the thermal conductivity of carbon fiber mat reinforced composite aerogel is as low as 0.048 W m−1 K−1 (25 °C). Aerogels are high performance material with high specific surface area, ultra-low density and low thermal conductivity [1, 2, 3]. Among the various types of aerogels, the oxide aerogels and carbon aerogels have attracted the widest attention. Oxide aerogels mainly include SiO2, Al2O3, TiO2 and ZrO2 aerogels [4, 5, 6], among which the SiO2 aerogels are most extensively studied. SiO2 aerogels have the property of ultra-low density, high porosity and ultra-low thermal conductivity . However, SiO2 aerogels suffer from poor high temperature stability and the decrease of specific surface area when heat treated over 1000 °C . Carbon aerogels possess excellent physicochemical properties with ultra-high specific surface area, low density and high wear resistance [9, 10], enabling it to be widely used in barriers, energy and catalyst supports [11, 12]. Nevertheless, the oxidation of carbon aerogel occurs in ambient atmosphere at as low as 400 °C . Therefore, how to improve the high temperature stability and oxidation resistance of aerogels have attracted interest all over the world. Zirconium carbide (ZrC) is a typical transition metal carbide with high melting point, extreme hardness and low density [14, 15]. Thus, it has great potential of application in heat resistant insulation materials, electrode materials and coatings field [16, 17]. Li et al. presented a method using polyzirconoxone (PZO) as zirconium source to prepared ZrCO/C composite aerogels. The results showed that the ZrCO/C composite aerogels possessed a higher specific surface area (589 m2 g−1) than the pure ZrO2 aerogels after heat treatment at 1500 °C. Hence, we predict that the novel ZrC@Al2O3@carbon aerogels would have the properties of excellent thermal stability and higher compressive strength compared with the traditional ZrO2 aerogels and carbon aerogels. Herein, we have developed a route combining sol–gel method with CO2 supercritical fluid drying technique to synthesis ZrC@Al2O3@carbon composite aerogels. The composite aerogel was prepared by mixing independently prepared ZrO2/Al2O3 sol and RF sol in one pot, followed by solvent exchange, CO2 supercritical drying and carbothermal reduction under flowing argon. 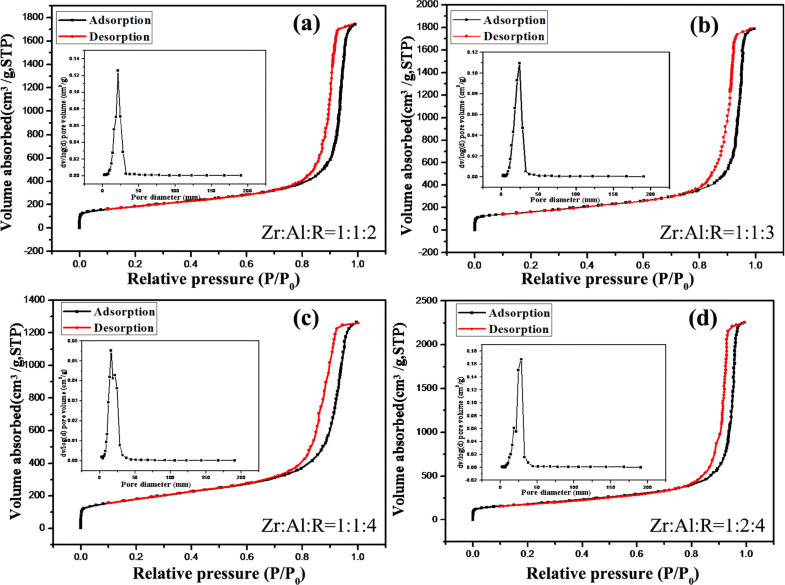 The effects of different Zr/Al/R molar ratios and heat-treatment time on the physical and chemistry properties of ZrC@Al2O3@carbon aerogels are investigated in detail. ZrOCl2·8H2O, AlCl3·6H2O, EtOH and water were directly mixed with a molar ratio of 1:1:15:55, stirring to prepare ZrO2/Al2O3 sol. Resorcinol (R), formaldehyde (F) and water were directly mixed with a molar ratio of 1:2:60, stirring to prepare RF sol. Then, ZrO2/Al2O3 sol, RF sol and PO were mixed with a molar ratio of 1:(2, 3, 4):4, and the mixture was put into new beaker. The wet gels were aged at 50 °C for 1 day and the aged gels were soaked with ethanol for 5 day. The wet gels were dried with supercritical fluid CO2 to form ZrO2/Al2O3/RF composite aerogels. 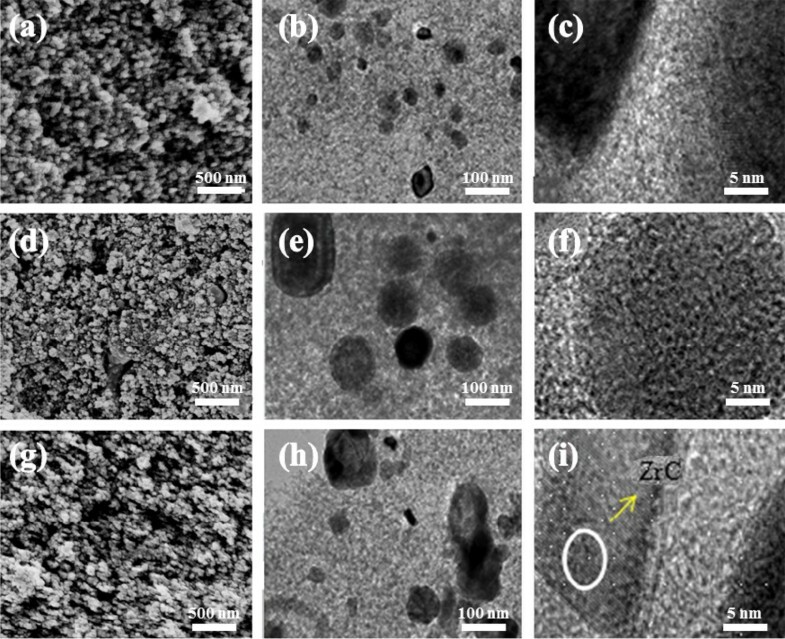 Finally, the ZrO2/Al2O3/RF composite aerogels were transformed into the ZrC@Al2O3@carbon composite aerogels by calcined at 1500 °C under flowing argon. The sample was heat treated in air at 650 °C for 3 h.
X-ray diffraction (XRD) patterns were performed by CuKα1 radiation (λ = 0.15406 nm) with a Rigaku Miniflex-600. Thermal gravimetric analysis (TGA) and differential scanning calorimetry analysis (DSC) patterns were recorded using a NETZSCH STA449C. Scanning electron microscopy (SEM) was carried out on a LEO-1530VP field emission scanning electron microscope. Transmission electron microscopy (TEM) was carried out on a JEOL JEM-2100 (HR) operating (200 kV). Infrared spectrum was investigated with a Nicolet Avatar IS-5. The thermal conductivity analysis was carried out on a Hot Disk-2500 thermal constant analyzer. N2 adsorption/desorption and pore distribution were obtained by using a Micromeritics ASAP2020. As is shown in Fig. 1, the ZrO2/Al2O3/RF composite aerogels are transformed into black-colored ZrC@Al2O3@carbon composite aerogels after calcined at 1500 °C. Due to the pyrolysis of organic constitutes, the linear shrinkage of ZrC@Al2O3@carbon composite aerogels are evidently observed during the carbonization process . Table 1 shows that the bulk densities of composite aerogel undergo a decrease-increase trend with the increase of Zr/R molar ratios. The gelation time of ZrC@Al2O3@carbon composite aerogels are determined by the gelation rate of both ZrO2 and Al2O3 gel, and the gelation time of ZrO2/Al2O3 gels are shorter than RF gel. PO is an effective proton capture agent which can slowly consume the H+ protons in H2O and its ring-opening reaction can promote the hydrolysis and polycondensation reaction of [Zr4(OH)8·(H2O)16]4+ and [Al(H2O)6]3+ [20, 21]. It is noted that the mechanical strength of ZrC@Al2O3@carbon composite aerogel is higher than the oxide aerogel after carbothermal reduction process. The compressive strength is as high as 1.31 MPa, which is higher than ZrCO composite aerogel (0.87 MPa) . Figure 2a exhibits the XRD patterns of the composite aerogels (Zr:Al:R = 1:1:3) calcinated at 1500 °C with different heat-treated time. With the increase of treatment time, the characteristic peak intensity of tetragonal ZrO2 phase (t-ZrO2) decrease, indicating the phase transition of ZrO2. It is also well known that the γ-Al2O3 phase can be transformed into α-Al2O3 above 1000 °C [22, 23]. It is worth noting that the characteristic peaks of tetragonal ZrO2 phase and γ-Al2O3 phase still exist in the composites after heat-treated at 1500 °C for 5 h, which can be ascribed to the inability of ZrO2/Al2O3 nucleus growth caused by the coating of the carbon aerogel particles on the surface of the ZrO2/Al2O3 crystals. With a higher heat-treated time at 1500 °C for 10 h, the t-ZrO2 phase almost disappear, and the intensity of ZrC phase is maximized. Figure 2a exhibits the XRD patterns of the composite aerogels (Zr:Al:R = 1:1:3) calcinated at 1500 °C for 3 h. As is shown in Fig. 2b, the weight loss of preliminary stage is about 15% with an endothermic peak at 65 °C, which is mainly due to the evaporation of ethanol and physically adsorbed water . The obvious exothermic peak in the second stage at 550 °C with a weight loss of 23% is mainly caused by continuous structural transition from boehmite to γ-Al2O3. The third region where a weak exothermic peak in the DSC curve at ca. 1020 °C, arise from the carbonization reaction of the composite aerogel with a corresponding weight loss of 5%. A significant weight losses occur in the last region, which corresponds to the structure transition of ZrO2 and a part of the formation of ZrC as is shown in Eq. (1) . The results are consistent with the results of XRD analysis. In order to understand the microstructure of the composite aerogel, Fig. 3 shows the SEM and TEM images of the composite aerogels (Zr:Al:R = 1:1:3) calcinated at 1500 °C with different heat treatment time. As is shown in Fig. 3a, d, g, we can see that the ZrC@Al2O3@carbon composite aerogels possess a network structure of connected nanoparticles after heat treatment at 1500 °C. The structure of ZrC@Al2O3@carbon composite aerogel is disordered but homogenious, with the scale of approximately 40 nm. It is mainly formed by different hydrolysis and condensation rate of ZrO2/Al2O3 and RF sol. Figure 3a, d, g show that the colloidal particle diameters are around 80 nm and the smallest nanopores have the diameters of around 40–70 nm after carbothermal at 1500 °C for 5 h. With the increase of heat-treatment time, nanoparticles adjoin more closely to each other and a certain amount of large pores with diameters greater than 200 nm emerge in composite aerogels, mainly caused by the consumption of the ZrO2 by its further reaction with RF aerogel. As is shown in Fig. 3b, e, h, a layer of graphitized carbon exist on the surface of composite aerogel and γ-Al2O3 inside the aerogel after heat treatment at 1500 °C. With the increase of heat-treatment time, the quantity and size of polygonal particles increase and the structural transition of composite occurs. As shown in Fig. 3h, i, the γ-Al2O3 phase has ca.45 nm length and the grain growth inside the composite aerogel can be observed after heat treatment at 1500 °C for 10 h.
Figure 4 shows the nitrogen sorption isotherms of ZrC@Al2O3@carbon composite aerogels heat-treated at 1500 °C for 3 h with different Zr/Al/R molar ratios. The curves include type IV curves with type H1 hysteresis loop in the IUPAC classification, which is correspondent to the mesoporous structure with cylindrical pores. Table 2 presents that with the increase of R/Zr molar ratio, the specific surface areas and average pore diameter undergo an increase–decrease trend. When the R/Zr molar ratio is 3, the BET specific surface areas of composite aerogel is as high as 650.4 m2 g−1. This phenomenon is mainly caused by the structural adjustment, damage to the porous network and shrinkage of the pore structure. The specific surface area of composite aerogel is larger than the ZrCO composite aerogel (637.4 m2 g−1), which is beneficial for applications in thermal insulations areas upon heat treatment over 1200 °C. With the increase of Al/Zr molar ratio, the average pore diameters are below 25 nm and the average pore diameter is as small as 21.8 nm with the Zr/Al/R molar ratio of 1:2:4. Table 3 shows the bulk density and thermal conductivity of carbon fiber mat reinforced ZrC@Al2O3@carbon composite aerogel with different heat-treatment time. In order to improve the poor mechanical properties of aerogels, they are reinforced with carbon fiber. Also, the addition of γ-Al2O3 phase is beneficial for improving the comprehensive performance of the composite aerogel, such as high thermal stability and low volume shrinkage. The thermal conductivity of carbon fiber reinforced composite aerogel undergo a decrease-increase trend. After heat treatment at 1500 °C for 5 h, the thermal conductivity of sample is 0.051 W m−1 K−1. With the increase of heat treatment time, nanoparticles adjoin more closely to each other, and the composite aerogel exhibits a compact mesoporous network, in which the pore size become smaller. Meanwhile, graphitized carbon on the surface of composite aerogel can effectively reduce the rates of heat transfer, which is beneficial to reduce the thermal conductivity of aerogel. However, with a further heat treatment time for 10 h, a small amount of large pores (200 nm) emerge in the composite aerogel, which is not favorable to low thermal conductivity of the composite aerogel. After heat-treated at 1500 °C for 5 h, the thermal conductivity of carbon fiber reinforced composite aerogel is as low as 0.048 W m−1 K−1 (25 °C), which is obviously lower than that of the pure carbon fiber mat (0.063 W m−1 K−1, 25 °C) and ZrCO composite aerogel (0.057 W m−1 K−1) . 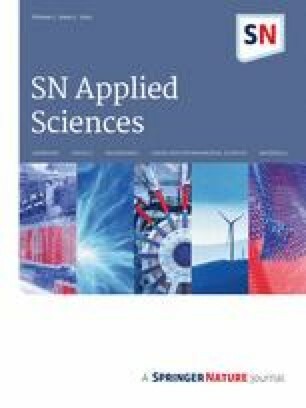 In summary, we have developed a sol–gel method combined with CO2 supercritical fluid drying technique to synthesis ZrC@Al2O3@carbon composite aerogel using economical inorganic salt of zirconium and aluminum. The addition of γ-Al2O3 phase is beneficial for improving the comprehensive properties of composite aerogel including high thermal stability and low volume shrinkage. The BET specific surface area of composite aerogel is as high as 650.4 m2 g−1, and the thermal conductivity of carbon fiber mat reinforced composite aerogel is as low as 0.048 W m−1 K−1 (25 °C), which is beneficial to the applications of thermal insulations and catalyst supporting at elevated temperatures. This work was financially supported by the Industry Program of Science and Technology Support Project of Jiangsu Province (BE2016171, BE2017151), the Major Program of Natural Science Fund in Colleges and Universities of Jiangsu Province (15KJA430005), the Program for Changjiang Scholars and Innovative Research Team in University (No. IRT_15R35), and the Priority Academic Program Development of Jiangsu Higher Education Institutions (PAPD).